[Update July 11th] YCT test results are just released. Congratulations to all the students who have passed the tests. We will notify all parents when the certificates arrive. November 2014 YCT Scores Released. All Participants at Our Testing Centre Passed the Tests! The November 2014 YCT (Youth Chinese Test) scores are released. Over 20 students took Level 1 - Level 4 tests at Meng Chinese Academy testing center on November 15. All students passed the tests this time. Congratulations!! The 10th Chinese School Association in the US is held in Phoenix on Dec 13-15 in Phoenix. This is the first time the conference is ever held in Phoenix city. Nearly a hundred Chinese schools from all over the US send in hundreds of delegates to the conference. As a member school, we attended the conference. Our faculty delivered two papers and presentations during the conference. However, the greatest accomplishment is our kids' performance! Thank you all to the parents and children who participated in the show. The children did a marvelous job. We are so proud of them! Wonderful Summer Experience in China! 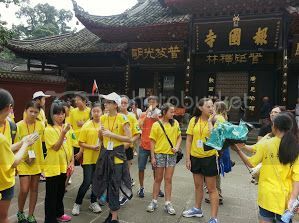 This summer we sent 4 children to 3 summer camps in China. One went to Xian camp, where the famous Chinese terracotta warriors are. Two went to Sichuan panda reservation. One went to Shanghai martial art camp. These camps are sponsored by the Chinese education department. Camp fees are paid for by the sponsor. The students only pay for the international airfare. It was such a wonderful experience for all the children. They all enjoyed the trip tremendously. We'll continue organzing such trips in 2015. Please watch our site for update. We’ll announce 2015 China camp earlier next year.